Play WWF Super Stars 2 Now! Do you have what it takes to be WORLD CHAMPION....again? This game is the second generation WWF SUPERSTARS. Gameplay is basically the same as in the prequel, but with one new feature, the steel cage match. 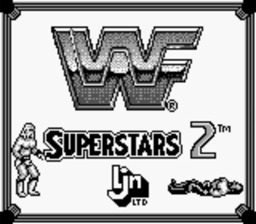 Play as one of six WWF wrestlers, including the Undertaker, Jake "the Snake" Roberts, the immortal Hulk Hogan, the Mountie, Sid Justice, and Macho Man Randy Savage. The graphics are alright, but I like WWF SUPERSTARS' graphics better. At least they look like real people now, and we can tell who they are. The sound is good, but for some reason the victory music sounds like the music they use at a high school graduation to me. In this game you have two different types of matches you can choose from. There is the normal one-on-one match and the STEEL CAGE match. There is only one way to win a steel cage and that is to climb out of the cage. To climb the cage lower your enemies stamina meter to zero (located at top of the screen near face and name) and walk over to the cage wall and B + directional button facing cage. To win a normal one-on-one match do the same thing, lower your opponent's stamina meter to zero and press B + Down directional button.